Click ‘Start’ or press F5 and you should see the demo UI as shown below. Select a demo on the left panel and hit the ‘Execute Demo’ button to execute a demo. You may also execute your own scan DSL (domain-specific language) code in “Run Your Own Code” - please refer to Asprise Scanning Request DSL for details. Later sections will introduce how to invoke the scan API without the UI. Download a copy of Asprise Scan SDK here. Simply unzip it. Hit ‘Start’ button or press F5 and you’ll see the demo UI as shown in last section. Asprise C# VB.NET Scanning SDK provides an powerful API for you to control the scanning process. "select", true, true); // "select" prompts device selection dialog. "select", True, True) ' "select" prompts device selection dialog. Line 3: Invokes the scan function with a new scan request. Line 4-5: Configures TWAIN scanning settings: color is RBG and paper size is US letter. Line 7-8: Specifies the target output: save scanned images as JPEG files on local hard disk. Line 11-12: Obtains the image files saved and prints out. Note that above is a basic sample use of the API. Asprise Scanning API provides far more functions. For example, instead of saving the images as JPEG files, you may request to return the images as PNG in memory or upload as a multi-page PDF file or combination of them. In addition to above object-oriented invocation of the scanning API, alternatively, you may specify scanning requests in JSON for brevity and readability. As JSON string can be easily stored and retrieved, it may simplify your job when you build functions like profile based scanning. If you simply need to display the scanned images in your application, you may consider to scan images into memory. Scanned images will be returned as a list of System.Drawing.Image. you can then display images on UI (for example, using PictureBox). With Asprise Scanning SDK, it’s easy to allow the user to scan and upload to the server. The server side script to handle the upload can be written in any programming language, ASP.NET, Java, PHP, Python, Ruby, etc. You handle the upload from Asprise Scanning SDK in the same way as you handle a simple HTML form upload. .AddPostField("title", "Test scan"))) // Additional data to be passed to server: post fields, headers, etc. When you upload the scan images, you may send along other data, such as post fields, cookies, etc. Authorization can also be configured. Please refer to Asprise Scanning Request DSL for complete options. Scanning multiple pages as a single PDF file simplifies organization. To do so, you need to set the format type to AspriseImaging.FORMAT_PDF. Additionally, you may add a text line to the bottom of the first page and set EXIF tags. When outputting PDF, Asprise Scanning SDK provides you powerful options listed below. PDF with CCITT G4 compression results extreme small file size. However, the tradeoff is that images will be in black/white. If PDF/A is required, you can configure to output PDF/A instead of normal PDF. When using PDF/A, you can’t set owner password or user password to protect the PDF file. Similar to PDF, TIFF also supports multiple pages in a single file. You set the format type to AspriseImaging.FORMAT_TIF to output TIFF files. Optionally, you can use CCITT G4 compression to reduce the file size. Even if your scanner doesn’t support barcode recognition, Asprise Scanning SDK supports quick barcode recognition. You set recognize_barcodes to true to enable it. Asprise Scanning SDK fully supports Automatic Document Feeder (ADF). Optionally, you may choose to automatically discard blank page. The following sections list common scanning related operations and tasks. The default source has its Source.defaultSource set to true. When listing sources using AspriseImaging.ScanListSources(true, "all", true, true), both feeder and flatbed units are detected. 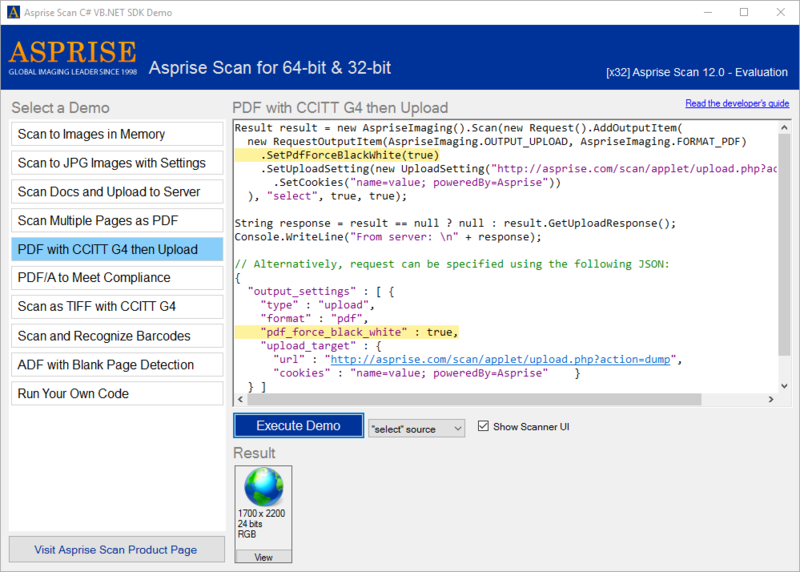 AspriseImaging.GetSource can be used to set and get capabilites. Note that in above code, “select” prompts the user to select a source. You may use the exact source name to select the device directly without prompting the device selection dialog. The rule of the thumb is that you should perform scan related calls from the same thread.